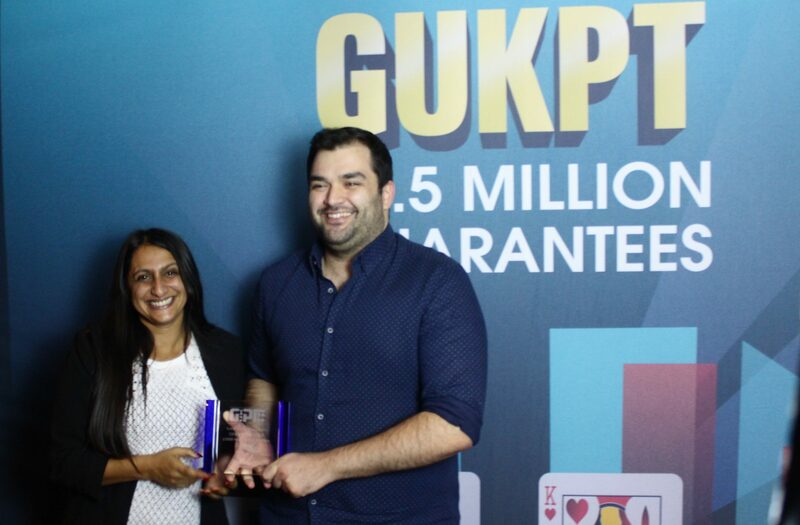 After one of the longest final days of the year, GUKPT Blackpool has come to a close with a more than worthy winner in Yiannis Liperis, he has finally got over the line. 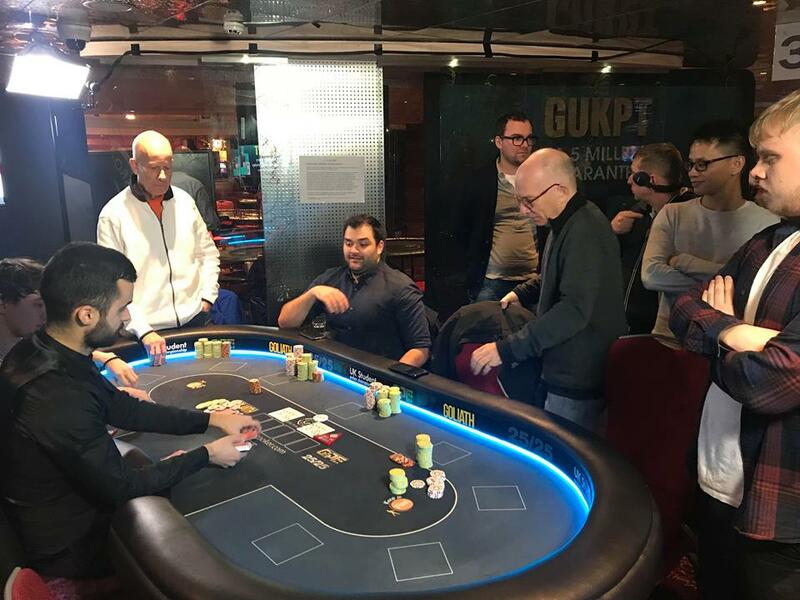 This week of poker is like no other, cash games are buzzing all day everyday, the side events are extremely busy and everyone is having a great time. If you’re going to attend one event next year it should be this one. Today has been a 14 hour day, mainly to due with the 3 and a half hour final table bubble, which seemed to go on an age. Eventually Alex Tuz busting in 10th place. 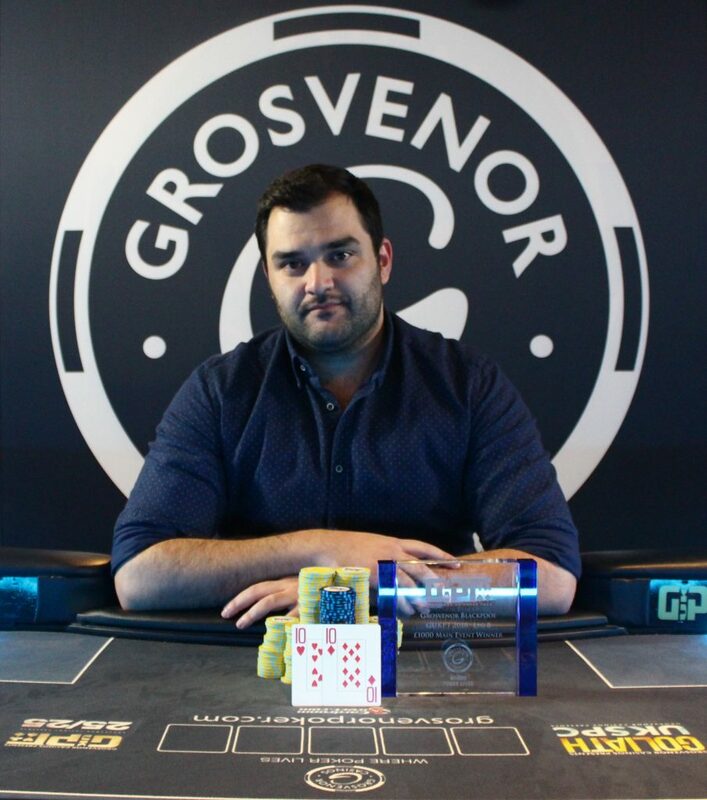 We hope you have enjoyed the coverage over the 4 days of play and we know Yiannis is going to be a very popular winner having finished second twice before. 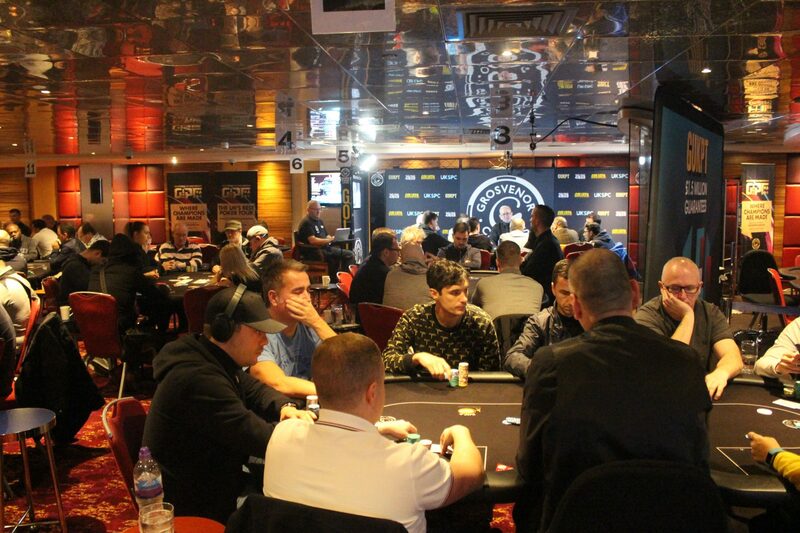 We will be back in less than two weeks time for the Grand Final, the big one held at The Poker Room where there will be a massive £400,000 Guaranteed!! Ning is all in holding A-Q against the pocket tens of Yiannis. The flop comes 10–J–3 as Yiannis flops a set, but Ning a gut shot. Ning Lu finishes in second place for £55,950. 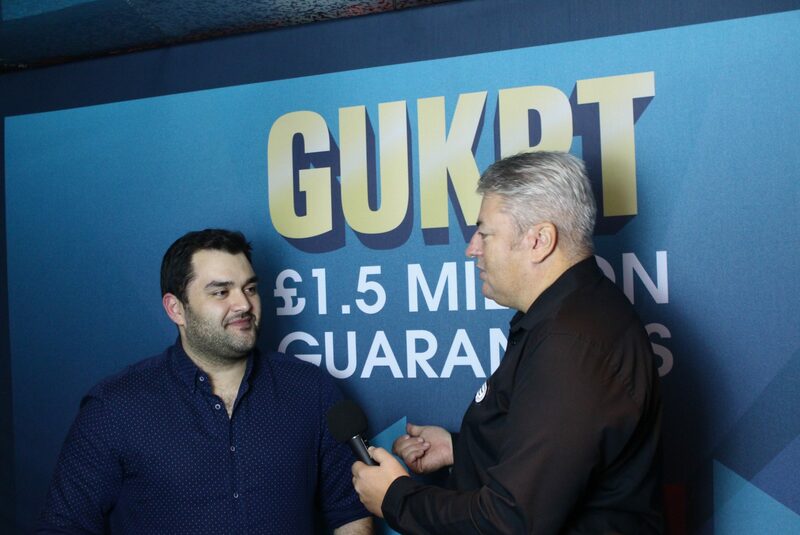 Yiannis Liperis is the GUKPT Blackpool Main Event Champion for £84,250. Ning down to just 1.1million calls it off holding against the for Yiannis. Ning flop a Jack to double up to 2.2million! The players take a quick 10 minute break. The first all and call Ning holds against the of Yiannis. Ning makes two pair and doubles back up to 3 million chips. Both players now have 30 bigs each. The blinds increase for the first time heads up. Both players now have 3 million chips. We are now heads up between Yiannis Liperis and Ning Yu. Yiannis has 3.5million to the 2.5million of Ning. Fred Maher loses a coinflip to bust in third. His pocket eights unable to beat K-Q. 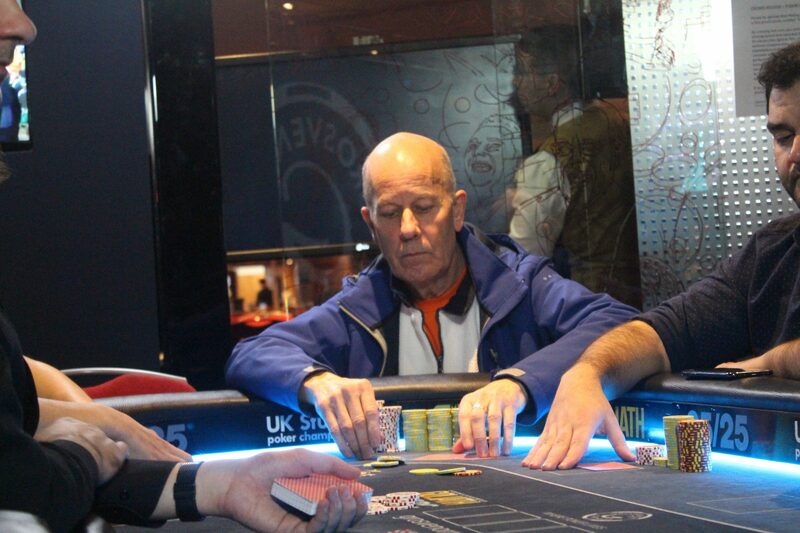 A great effort from Fred who finishes in 3rd place for £34,350. The players are back to play level 29. We begin this level with the blinds at 30,000/60,000 with a 5,000 ante. Break time now for the players as they take 15 minutes. James Mitchell moves all in for his ten bigs and is called by Yiannis Liperis. James tables and is in bad shape against the of Yiannis. No help for James on the board, despite turning a straight draw. He heads out in 4th place for £21,850. Yiannis takes a commanding lead as we are now three handed. 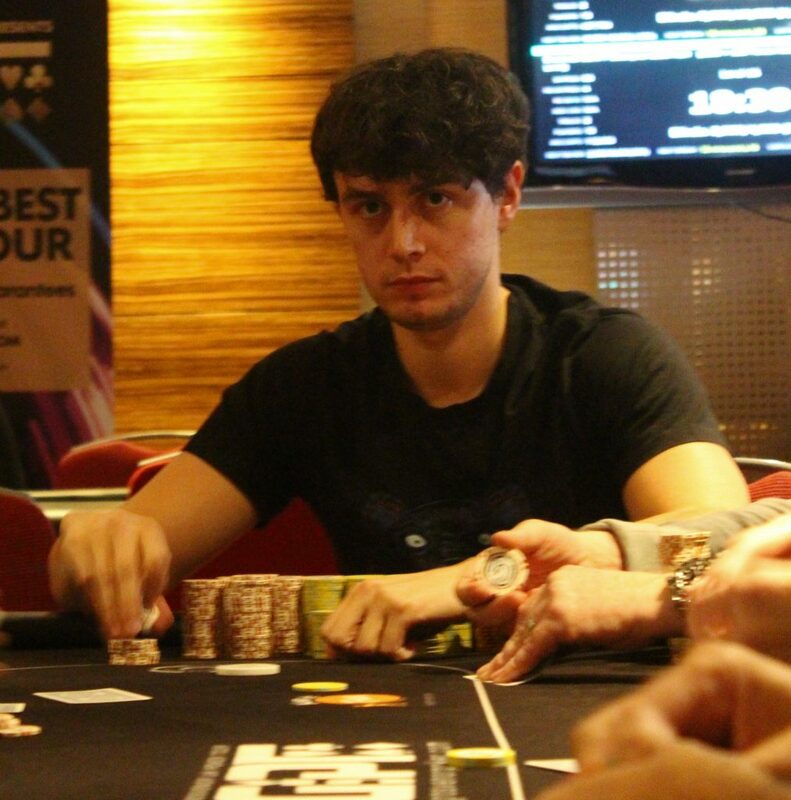 Jack Oliver moves all in for his 600k stack and is called by chip leader Yiannis Liperis. Jack tables and it’s a flip against the of Yiannis. The flop comes as Yiannis takes the lead. Jack now needs to hit a nine to survive. 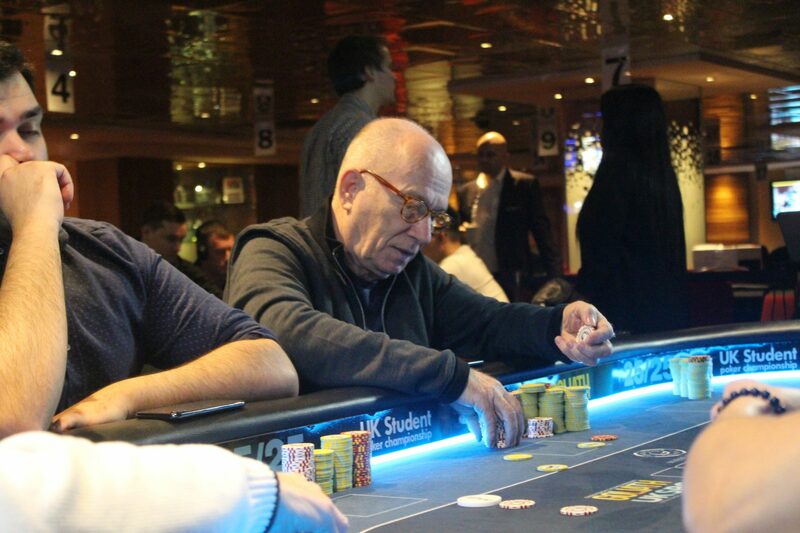 Full house for Yiannis as he takes the pot and now has half the chips in play with 3million! 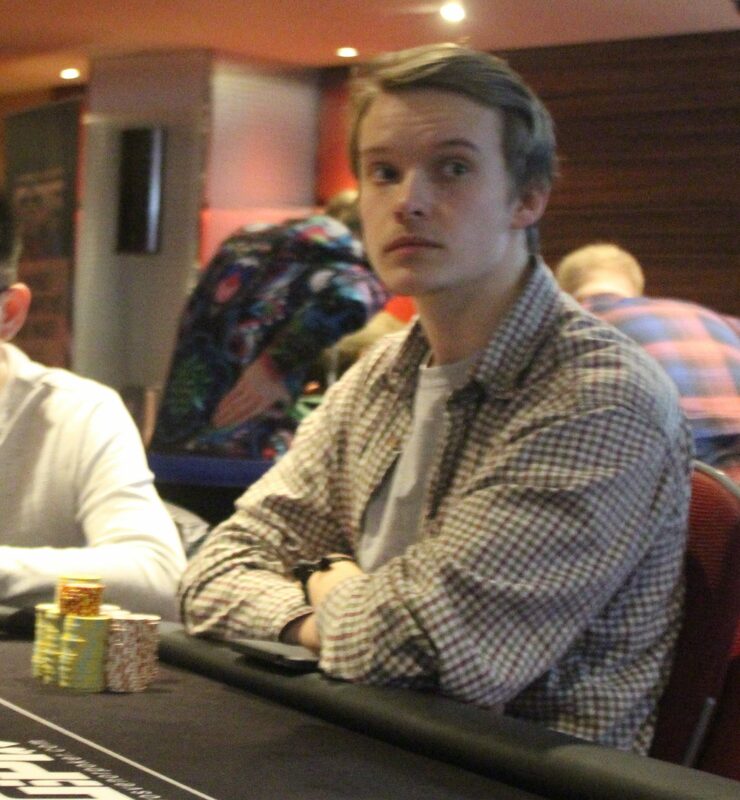 We lose Jack Oliver from the tournament in 5th place for £14,900. The blinds increase as we begin level 27. They are now 25,000/50,000 with a 5,000 ante. Ning Lu opens to 85,000 and is called by Liam Hooks in the big blind. The two players see the flop which comes Queen high with two hearts. Liam checks to Ning who bets 90,000, Liam moves all in for around 350,000 and Ning makes the call. Ning tables for a flush draw and he has Liam crushed who shows for a worse flush draw. No help for Liam and we lose him in 6th place for £10,950. The players are back seated as we begin level number 25. The blinds are now 20,000/40,000 with a 5,000 ante. All is quiet in the last half an hour or so at the feature table, we still have 6 players remaining., who are all locked up £10,950. Jack tables and is in bad shape against the of Yiannis. Jack rivers a queen to take the pot. Doubling to 750,000! The blinds increase as we begin the next level of play. They are now 15,000/30,000 with a 3,000 ante. On a flop of Andrew Garland gets his final 250,000 in the middle and is called by Ning. Andrew tables and is in bad shape against the of Ning. The king plays for Ning as he takes the pot and moves over the 1 million mark. 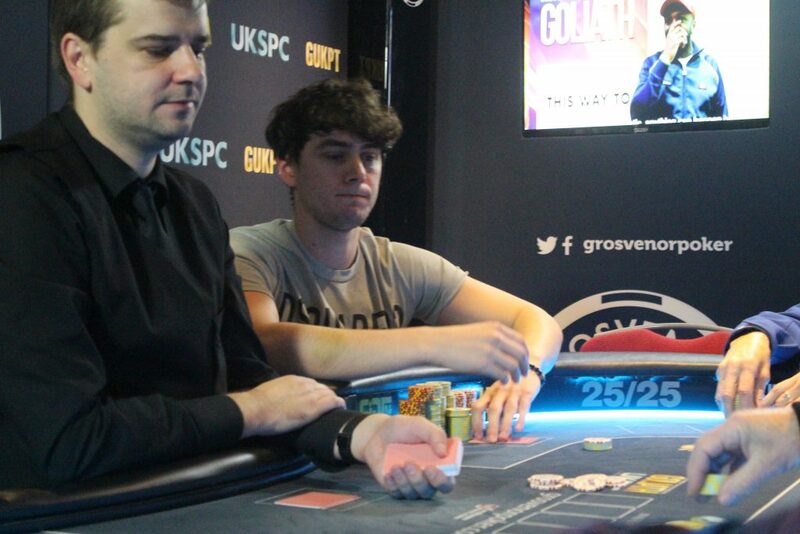 We lose Andrew Garland in 7th place for £8,500. Barry loses a big flip to Ning. Tens no good against Ace-King of Ning. He gets his final chips in the middle holding against the pocket sixes of Jack Oliver. Sixes hold for Jack who takes the pot and eliminated Barry. 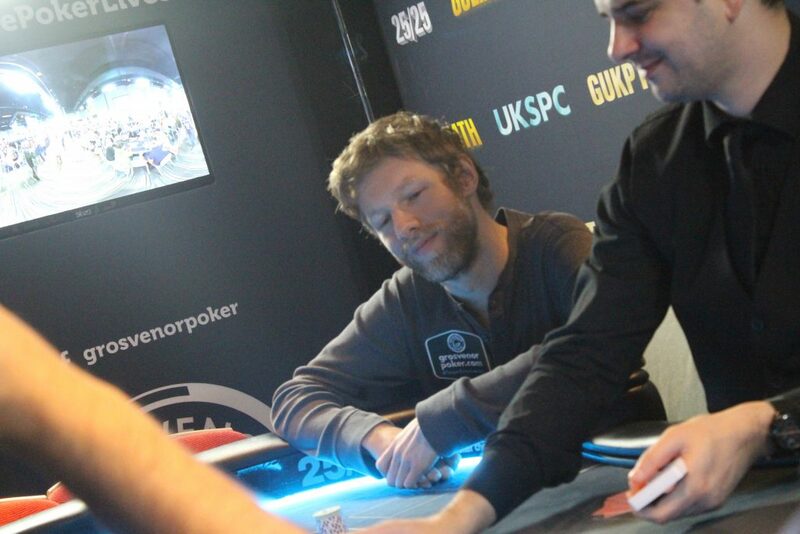 It’s been a rollercoaster for Barry as he finishes in 8th place for £7,000. Chris Gatley makes it 50,000, Yiannis Liperis three bets to 135,000, Chris moves all in for just short of 600k and Yiannis makes the quick call. 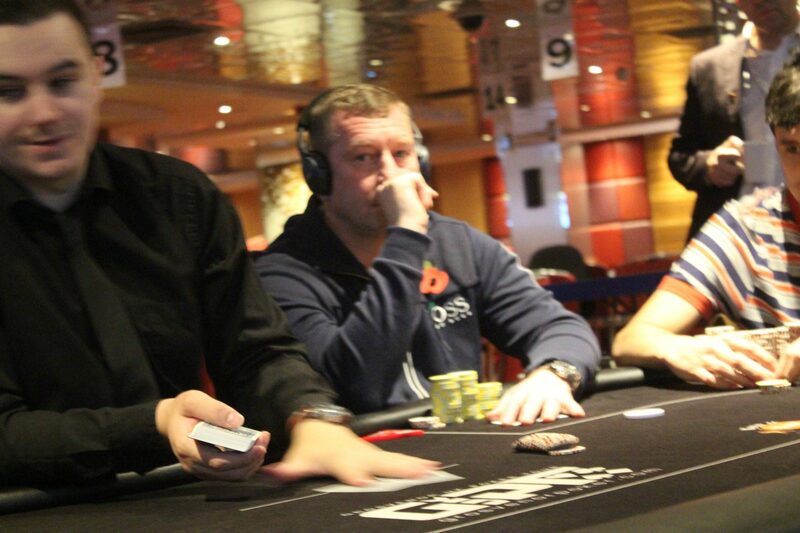 No help for Chris and he exits the final table in 9th place for £5,800. The cards are in the air as we begin the final table! Blinds starting at 12,000/24,000 with a 3,000 ante. Break time now for the players as they take a 45 minute dinner break! After three hours the final table bubble has just burst! Alex Tuz gets is 450,000 stack all in holding against the of Yiannis Liperis. Yiannis takes the pot with two pair. Alex finishes in 10th place for £4,850. We are still hand for hand on the final table bubble, there’s no real short stack in danger of busting currently. This could be a long one. The blinds increase as we begin level number 23. They are now 10,000/20,000 with a 2,000 ante. We are now hand for hand as we are on the final table bubble. James Mitchell opens, Kingshuk Ghosh moves all in for 220k. James makes the call and the cards go in their backs. James tables and it’s a coinflip against the of King. James makes top pair to take the pit. He now has 700,000. 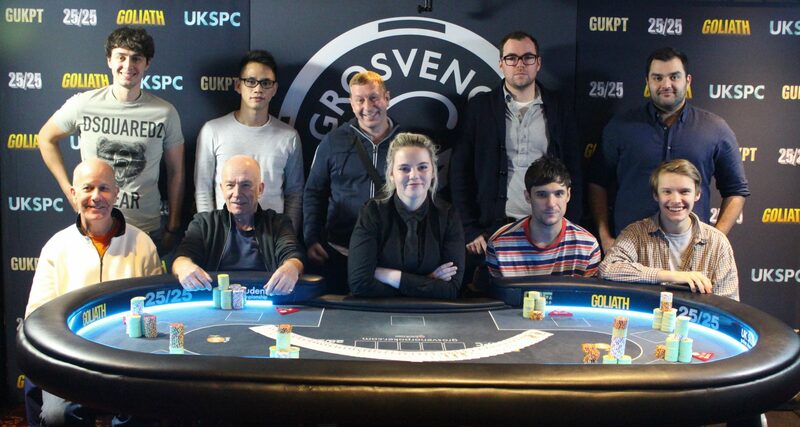 We lose Kingshuk Ghosh in 11th place for £4,250. Andy Hills loses a flip to Fred Maher. He then gets it all in holding K3 against Q4 for his last 25k. 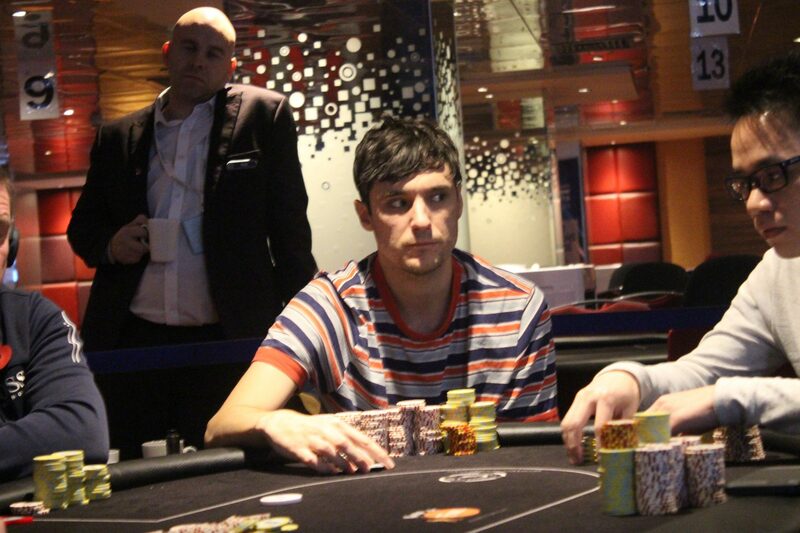 His opponent hits a Queen and a four for two pair and we lose Andy Hills in 12th place for £3,950. They are now 8,000/16,000 with a 2,000 ante. Ryan Fronda is the first player to bust today, after doubling Barry Grime up, he gets his last 80k all in holding and runs into the of Jack Oliver. No help on the board for Ryan and he exits in 13th place for £3,650. The cards are in the air as we begin Day three. The blinds are starting at 6,000/12,000 with a 1,000 ante. The players have just been called in to take their seats. We should be underway very soon. Good morning and welcome back to Blackpool for the Final Day of the GUKPT Main Event. From 304 entries there are just 13 coming back for the third days play. We have a great field coming back and it should be another great days play. The players are guaranteed £3,650, but all have their eyes on the first place prize of £84,250! Play will begin at 12pm.